On this page you'll find answers to the FAQs (frequently asked questions) that I've received about boodocking, living frugaly on the road, and traveling the way we do. Ask your own new questions here and I will answer those that I can. Previously asked questions and comments follow the form below. I invite those of you who are already following your own dream and living "on the road" to contribute your opinions, comments, and responses. I will publish all relevent, respectful comments, whether or not I agree with your particular point of view. For many, the idea of embarking on the dream is still daunting. The first step is the scary one. It's my sincere hope that you'll find answers, knowlege, and especily inspiration in these pages. This is the place for everyone to ask questions and seek advice about any aspect of RV travel. My title is my question. Thank you. 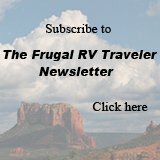 Have you and or will you RV travel to BC and east coast? Buying Father-in-Law's RV - Good Deal? Is it safe for a woman to RV alone? With a dog? Across Canada and USA only. I'm in North Carolina and we have lost power to our house can I run my propane tank to heat up my rv with out being hooked up to power . Buying, insuring and licence plating a RV in the U.S. If you are a visitor. I would appreciate any tips on keeping toilet facilities usable in Canadian winters. I haven't been able to work that one out. 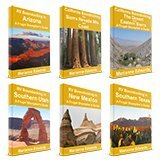 are your boondocking books only ebooks or do you have paperback copies? How Current is Your Information? We are considering full time travel in a 30 foot trailer. What type of rig would be the best to tow it? Would a V8 Pontiac Van work? What to do with your Home? Are There Sites for Boondocking with a 40' RV? What is a good car to tow when RVing with a Class A?